Lookery is a new company that’s launching an ad network targeted at Facebook applications, helping advertisers reach the social network’s 32m users. It is the brainchild of Scott Rafer, an entrepreneur whose last venture was MyBlogLog, sold to Yahoo! in January for $10m (£5m). He has launched Lookery in conjunction with Compete co-founder David Cancel. Because the terms of Facebook’s new open platform allows third party developers to access user profiles, Lookery hopes to provide advertisers with detailed data that will allow precise targeting of ads. Though this data can only be held for 24 hours, Lookery can still use it to build up demographic profiles of the types of applications that different groups of users are adding to their profiles. Lookery launched last week, so has only has a small number of publishers signed up so far, including Lending Club, which has been successful so far on Facebook. 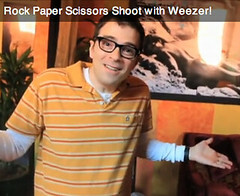 Weezer is no stranger to YouTube. In 2008, the group put many viral video stars in the video for its single Pork and Beans. This week, the Snuggie loving band took its internet fanboy status to a new level, announcing the launch of its new album by appearing in 15 new videos created by popular YouTube users. Weezer is just the latest big brand to hitch its cart to smaller, more nimble digital success stories hoping to win new fans (hello Gap ads featuring the Foursquare founders). Can internet goodwill sell albums? Not everyone is sure that the deal between Yahoo and Microsoft will work out the way Yahoo and Microsoft hope but by in large, advertisers and search marketers are excited about the deal. to be good for consumers and, therefore, good for advertisers“. Film studios are working pretty hard to make sure that new online rental services don’t steal all their profits. But outside of movie theaters, they aren’t entirely in control of the distribution of their content. And if the studios aren’t careful, in the process of negotiating revenue deals, they might further choke off their own revenue streams. Warner is trying to tap into Netflix’s increasing revenue potential. If Netflix gives in to Warner’s demands, other studios will follow suit. And if the studios are too greedy in their demands, they might lose out on even more money.